Since I know next to nothing or less about computers and codes and stuff, I decided to use Godaddy.com for site management, handling backup, security, updates, all the stuff that goes into maintaining a website. I get to do all of the blogging fun stuff, I suppose it’s one of those “all of the pleasure, none of the guilt” things. I’m hoping to go live with iknead2knit.com on Monday, 1/26/15 and plan on keeping iknead2knit.wordpress.com going for a little while, probably mostly with links to the new site, hoping to make an easy transition. As always, I’m always open to suggestions; I know there are a lot of bloggers who are old hands at this website stuff, and any tricks or tips will be appreciated. Up until the last month or so, the grands and Josie the Pug weren’t a good mix. Not because she doesn’t like kids- she LOVES them- but her being who she is, a lot of dog in a small body, and very exuberant, with lots of snorting, the littles were intimidated, shrieking and running whenever she got a little too close. This was more than a little upsetting for Mr. iknead and me, having to keep Josie and the grands separated, usually with Josie having to be either in her kennel, in another room or boarded. So hard! Anyhow, all this changed over the last month or so and now, the Papoose, the Sprout and Josie are the biggest, bestest friends forever! Yeah, Mr. iknead and I are pretty much over the moon about it. Look. How bout that! Heaven for us all! Know what? In the grand scheme of things, whether or not my internet is or is not working just really isn’t a big deal, it’s nothing and I’ve spent waaaay too much time and energy fussing and fuming about it. I’ve been too busy bitching and moaning to do things that, to me, are much more important – like reading other blogs,commenting and responding to the comments others leave for me. It’s not about pretty postings and perfect pics, it’s about community, connecting and communicating and really, it’s all good. I’ve been sort of hit or miss with blogging these past few weeks, and I’ve missed sitting down and putting my thoughts in order and then onto paper or into my iPad. I’ve been too busy painting or drawing (these are new things for me) or reading or knitting or baking or gardening or art journaling or throwing pots or grandmothering or any of the other things that grab my interest. Here’s the perfect description for what I’m blessed with – an embarrassment of riches. According to (all-knowing) Wiki, an embarrassment of riches is an idiom that means an overabundance of something, or too much of a good thing. All these things do more than keep me occupied – they feed my soul, I guess you could say I have an embarrassment of blessings. With all the above said, I think what I really mean is “Thanks, God, for everything”. A pair of Los Manos Locos or Crazy Monkey Socks, a twist on Cookie A’s awesome Monkey Socks, toe up and purl-less. This colorway is called Java Jive and I’m loving how it’s knitting up. You can find out more about this yarn here. A Baby Brother drum carder. So, once again, I’m running a marathon between my front door and my knitting chair, jumping up and checking every time I hear or even think I hear a big truck in my neighborhood. Can you tell I’m excited? Much as I love spinning, I hate hand carding, prompting this newest purchase. I still have a TON of alpaca from the Diamond State Fiber Fest that’s clean and ready to card and eventually, to spin. Come on, mailman/Fedex man/UPS man! Stop at my house!!!! I knew it had been a while since my last post, six days, in fact and besides just laziness when I’m not caught up in regular daily stuff, I have no excuse. For some reason, blogging just hasn’t been on my radar lately. I think about doing it all the time, even jot down blog ideas, but for the past week or so, that’s as far as it’s gone. (Gives herself a good talking to about idle hands being the devil’s workshop and all that). Best book I’ve read since I don’t know when: The World’s Strongest Librarian. Seriously. Awesome. Book. Run, don’t walk to wherever you get books and give it a preview. I laughed, I cried, it became a part of me. (No joke). A rare moment of stillness. Is she beautiful or what? With such a difficult week last week, I’ve let my blog slide and I can tell. I’ve missed blogging and reading other’s blogs. It’s good to be back. Again, with all that’s gone on the last couple of weeks, I totally forgot to show off my first photoworthy wheel thrown pots. So, without further ado, here they are. 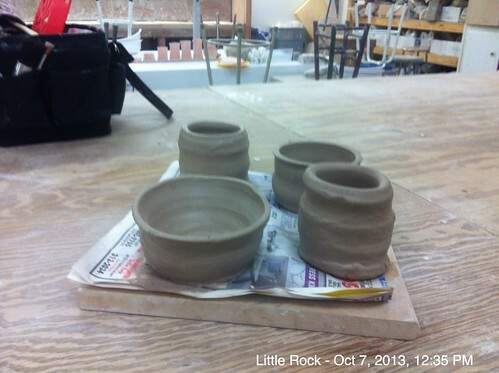 Today’s a pottery class day. Hopefully, I’ll have something to show off by the end of class – if I can remember to take a picture! about why I’ve not been blogging for the last few weeks. To tell the truth, I’ve felt overwhelmingly overwhelmed for the past few weeks, what with my Dad’s cancer diagnosis and his passing, my Mom’s dementia and getting her transferred to a nursing home here in Little Rock, trying to get their home of nearly 50 years cleaned out and ready to sell, notifying everyone who needs to be notified about the huge changes, like the bank, insurance companies, retirement accounts and then getting the word out that Mom is being moved to Little Rock, getting mail forwarded, bills paid and the list seems endless. I’m telling you, my Superwomen cape has taken a beating here the last little bit and is a little worse for the wear, so I gave it a well deserved mend and rest. It’s back on now and I feel ready to jump back into my real life. Mom is adjusting well to her new digs, the light at the end of the endless paperwork tunnel truly seems brighter and closer and I’ve learned (at least until next time) that the world won’t stop spinning on its axis if I don’t get everything crossed off my to do list every day. So, all in all, life is good, all of us are happy and healthy, with jobs and homes and food on the table. Life really is lovely, I think.